In an industry usually concerned with “moving units,” cashing in on the latest literary by-product of a reality television non-personality, or pushing out fiction that degrades the genre to a near metaphysical endpoint, it is a rare occasion when a publisher can be said to have acted “heroically.” The Letter Killers Club by Sigizmund Krzhizhanovsky (hereafter referred to as SK) represents an occasion to celebrate. With a downright intimidating name (unlike the two-syllable names of thriller writers on bestseller lists), the novel revolves around the machinations and stories told by a secret society in the 1920s Soviet Union. It is heroic to publish such a perplexing little volume by a Ukrainian Soviet writer who, according to the copy on the back cover, “went unpublished, though he was active among Moscow’s literati in the 1920s.” Seriously, why publish this? One could make more money releasing another volume of Ghostwriters Working for the Kardashian Machine. Let’s add zombies to Jane Austen or androids to Tolstoy. “Hey, at least people are reading!” quoth the sycophants of the Lowest Common Denominator. Don’t let the author’s name or the strange plot dissuade you from reading this remarkable novel. Written in 1926 when Soviet Modernism slowly faded into the Stalinist Philistinism of the 1930s, the novel follows the meetings of a secretive group named “the Letter Killers Club.” Totalitarian paranoia taints the barbed elliptical narratives of the group members, creating stories that bristle with erudition, humor, and beauty. “The Letter Killers Club” involves each member taking an alias that is a nonsense syllable. The names (Rar, Mov, Tyd, etc.) sound like the characters from Samuel Beckett’s Endgame (1957). The group gathers in a dark study. Empty bookshelves surround them. Every week a single member tells his story, but is duty bound not to publish his “conception.” The strictures recall the random oppressions of the police state. While the 1920s saw an aesthetic flowering in the Soviet Union, its totalitarian terrors existed under the aegis of Lenin and the Party. Stalin simply intensified and expanded the Reign of Terror. The rigidity of the rules also predicts the severity of Oulipo (a literary movement that began in the 1960s). The meetings frame the stories, each meeting offering a different genre. The first story is actually a play, a heretical dissection of Hamlet. The play splits the characters into two entities; ergo Guildenstern becomes Guilden and Stern. Dueling Hamlets recite the “To be or not be” speech. In addition, the play’s actors go to The Land of Roles meeting previous actors who played Hamlet. The story is playful and postmodern, anticipating Tom Stoppard’s riff on the Bard’s most famous play. The fourth-wall-breaking and Land of Roles remind one of the anarchic interrelationships of Los Angeles and Toontown in Who Framed Roger Rabbit? (Robert Zemeckis, 1988). Another story involves the transmission of a virus that turns people in automatons. Part science fiction, part biological horror, and part political satire, the story explores the same territory of Yevgeny Zamyatin’s We (1921). In this case, a scientist desires to make the mentally insane more productive members of society with a technique of remotely controlling the brain functions. What started as a technology “for the common good” becomes an instrument of totalitarian control. Other stories include a fable set in medieval times and a tale of a recently deceased Roman missing his requisite obol for his journey across the River Acheron. To complicate matters, the narrators get interrupted, chastised, or, a la “Exquisite Corpse”, other members finish the stories. The interruptions and snide commentary should be familiar to anyone seeing an Internet comment thread. If you disliked a casting choice in a movie involving a Marvel superhero or something similar, then you’ll enjoy the snark targeted at the storyteller. The snark and commentary in this cabal-like setting stands in stark contrast to the public uniformity of the police state. Even with the strictures and severity, the narratives, albeit unwritten, transcend the terror and stifling monotony outside the dark walls. 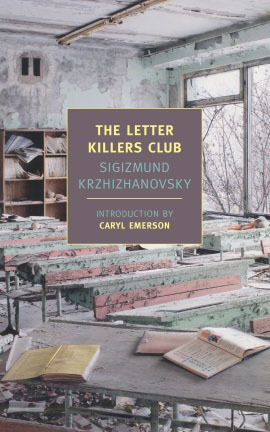 SK’s The Letter Killers Club is a monumental literary discovery, a gem buried in the Soviet Archives and only unearthed in 1976. With its daring experimentalism and acid commentary on state power, the book still stands as a work of revolutionary power. A wonderful review! I do like my Russian literature (well, more interested in Russian music — Schnittke, Shostakovich, et al and films, Man With a Movie Camera, The Slave of Love, Unfinished Piece for a Player Piano, etc).